May 9th at 7pm at Cummins Chiropractic & Wellness. 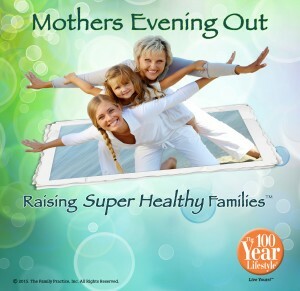 Join us on May 9th at 7pm for a Mothers Evening Out workshop on Raising Super Healthy Families. Led by Olympic rowing champion and mother of three, Anna Cummins, this 100 Year Lifestyle Raising Super Healthy Families workshop will empower Bellevue’s mothers to take an active role in the health and wellbeing of their family. Covering strategies to raise kids with healthy values, make healthier choices in your home, make drug free choices, improve posture and maximize health. Mrs. Cummins will also present information on how chiropractic can play a role in the prevention of illness by boosting the body’s natural immune system and natural ability to heal itself. Please RSVP to our Facebook Event page or call the clinic to reserve a spot for you and a friend: 425-590-9158. *Nursing moms welcome to bring baby and all kids are welcome, however young children may have a hard time sitting still for the hour long program.